John Fisher, Artistic Director of Theatre Rhine, in conversation with Richard Wolinsky. 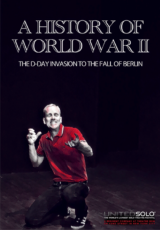 Director, playwright and actor John Fisher discusses his one-man show, “A History of World War II” at the Marsh in San Francisco Nov, 8 – Dec. 16, 2018, Thursday and Saturday evenings. He also talks about the current Theatre Rhino season, which opened with the musical “The Boy From Oz” about the life of gay singer/songwriter Peter Allen, playing at the Gateway (Eureka) Theatre through Nov. 17, 2018. Also: Review of “Men On Boats” at ACT Strand through December 16, 2018.